ALLOUEZ — In 2016, half of the funerals in the United States (50.1 percent) involved cremation. The number was slightly higher in the state of Wisconsin, all according to the Cremation Association of North America. By 2030, the National Funeral Directors Association projects that the rate of cremations will cover 71 percent of all deaths. After the cremation, though, what happens to the remains? Sometimes, they end up in someone’s home because of lack of funds, or because the survivors aren’t sure about the teachings of the church. Others are not able to let their loved ones go as they struggle with grief. Because of this, the Diocese of Green Bay is offering free interment of cremated remains in its mausoleum at Allouez Catholic Cemetery. 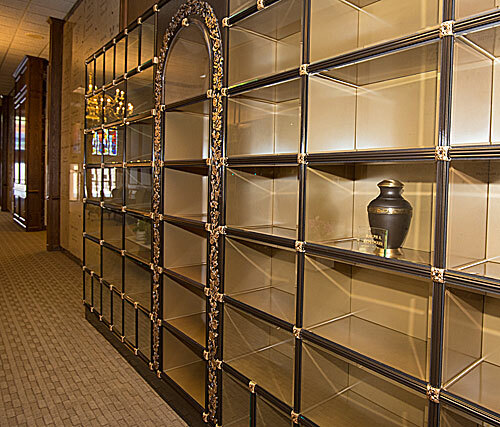 The service, and placement of the cremated remains in the All Souls Remembrance Crypt in the mausoleum, is open to anyone, of any faith or of no faith. On Saturday, Dec. 9, at 11 a.m., a special committal service for cremated remains will be held at the Allouez mausoleum. Bishop David Ricken will lead the service, which is planned to become an annual event. For more than 50 years, the Catholic Church has accepted cremation, and allows the same funeral rites for those who are cremated as for those who are being buried or entombed. However, not everyone is aware of this and some may still remember a time when cremation was not allowed by the church. This is one reason for a service such as the one on Dec. 9. He added that it is also acceptable to have a funeral with the cremated remains present and that the rites are the same as when the body itself is present — except for the placement of the white funeral pall and for an alternate form of dismissal. Still, since funeral costs can be high, Poradek said that the church accepts that a funeral may need to take place with cremated remains. What happens after that funeral can be more complicated. He has even heard of some cremated remains being made into tree fertilizer pods. The church frowns on this, as well as the practice of scattering ashes, he said, because such acts don’t respect the dignity of the body. Burial of cremated remains in a cemetery or placement in a mausoleum is acceptable, and can be made affordable for many people. “People say, ‘I’ll just take them home because it’s more financially feasible,’” Poradek noted, adding that this is partly why the diocese is offering free committals at the Allouez cemetery. “This provides people the opportunity — for free — to be able to be interred,” he said. The remains will be placed, individually, within the All Souls Remembrance Crypt. There will be a book with the names of all those interred in that crypt. If, at a later time, families wish to move the cremated remains to another part of the Allouez cemetery, they can be disinterred from the crypt for free. If the crypt ever becomes full, the remains might be moved to another part of the cemetery, but such transfer will be done for free. The cremated remains will always have the consecrated grounds of the mausoleum as a final resting place. Poradek said the idea of an annual All Souls Remembrance, and free interment for human cremated remains, began with the Archdiocese of the Milwaukee in 2016. The response to that first service in Milwaukee — with more than 20 interments on one day — led Poradek to look into arranging such a service in the Green Bay Diocese. He said the plan is to have an annual event, held close to or on All Souls Day (Nov. 2). He added that other dioceses around the country are planning similar services. He added that burying and praying for the dead are recognized as works of mercy in the church. And, from a practical standpoint, interment in a mausoleum avoids the problem of what to do with cremated remains as time goes by. In order to have cremated remains interred for free, an interment authorization must be filled out and filed with Allouez Catholic Cemetery and Chapel Mausoleum. There is no charge for the form or for interment in the All Souls Remembrance Crypt. For more information, contact Mary Breivogel, cemetery administrator at (920) 432-7585.